Marina City is an innovative urban development with a very unique origin. In the 1960s, decades before a return to city living came into vogue, Chicago's downtown was rapidly losing its middle class to the suburbs. Among the civic leaders focused on this issue was William McFetridge, president of the Building Service Employees International Union (BSEIU, often referred to as the Janitors’ Union). He worried that the downtown economy was headed in the wrong direction-and with it, the jobs his workers depended upon. McFetridge teamed up with Chicago-born and Bauhaus-trained architect Bertrand Goldberg. They came up with an unconventional solution: a residential project attractive enough to convince people to live in the city. Goldberg envisioned a “city within a city” in the center of Chicago’s downtown. Anchored by circular twin towers and sited on the north banks of the Chicago River, his concept for Marina City offered parking (20 stories), living units (900 apartments over 40 stories), office and commercial space, and an array of amenities, including a theater, marinas for personal watercraft, and even an ice skating rink. Though he was a protégé of Modernist architect Ludwig Mies van der Rohe, Goldberg departed from Mies' clean, rectilinear forms. For Marina City, Goldberg designed two dramatic, round towers with flowing curves. The buildings were innovative not only in their design, but also in their construction. Marina City was the first major building project to use slip-form concrete construction, with fiberglass molds making it possible to add a floor a day. 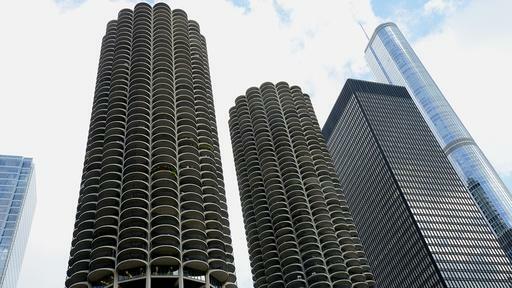 When it was completed, Marina City was one of the largest reinforced concrete building projects in the world. The curvilinear shape of the towers created pie-shaped residential units modest in size, but huge on Modernist style. Adding to the appeal, large, rounded balconies offered spectacular city and river views. Financed by the Janitors’ Union and three other unions, the project was wildly successful. More than 3,500 applicants applied for the 900 apartments. 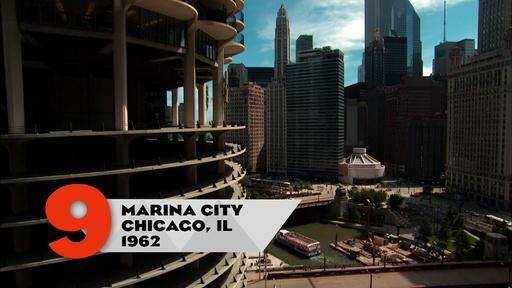 Marina City remains an iconic symbol of city living, a movement that it helped to reinvigorate. Explore the Marina City website. View a vintage film on Marina City's construction. Learn about another Bertrand Goldberg "city within a city" in Chicago. Take the Chicago Architecture Foundation River Tour. Marina City was designed to encourage people to return to city living.